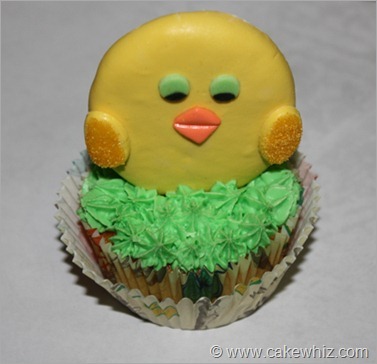 Learn how to make easy Easter chick cupcakes with this cake decorating tutorial. These easy Easter cupcakes are made with cookies, frosting and fondant. Easter is only a week away and to celebrate, made these cute Easter chick cupcakes! I was thinking of making bunnies but quite frankly, I find chicks cuter…lol. 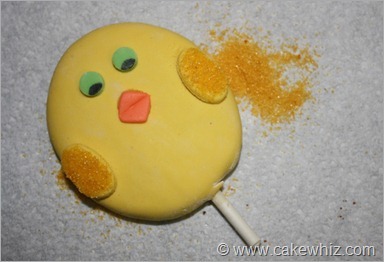 I made two types of Easter chick cupcakes…. hatching ones and baby ones. Which do you like more? My husband and I like the hatching ones. They make me smile anytime I look at them. 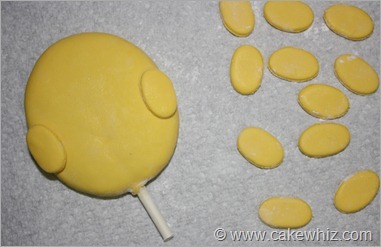 Initially my plan was to just make Easter chick cookie pops but I think it’s cool to use them as cookie toppers. This way, you get to enjoy a cupcake and a cookie. 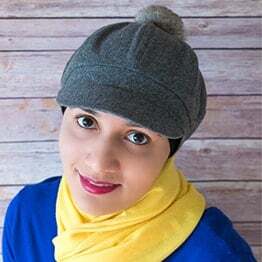 Roll out yellow fondant on a surface that’s covered in powdered sugar. Powdered sugar prevents fondant from sticking to the counter top. Bring out your chocolate cookie pops. Brush some glace icing or royal icing or even some corn syrup on top of your cookie pops. Make sure it’s a thin coating. 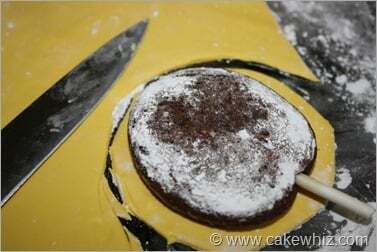 Place this sticky side on top of the fondant and hold it in place. 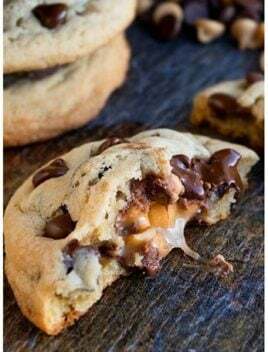 Use a knife to cut around the cookie. 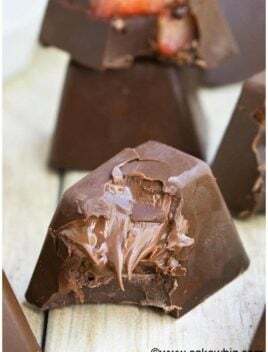 Fold fondant inward and smooth out the sides with your hands. 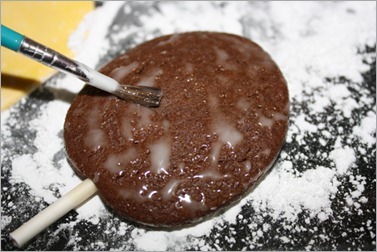 Dab your finger in some shortening and run it on top of your fondant covered cookie to clean off all that powdered sugar. This will be your chick’s body. 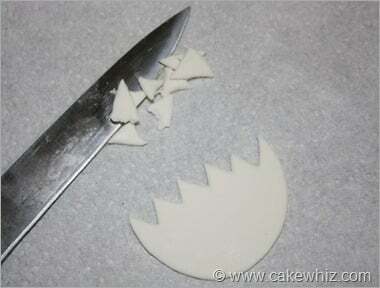 To make wings, cut out oval shapes using the smallest cutter from Wilton’s oval cutter set. Brush some water on the sides and stick these ovals there. Bring out green and blue confetti sprinkles. 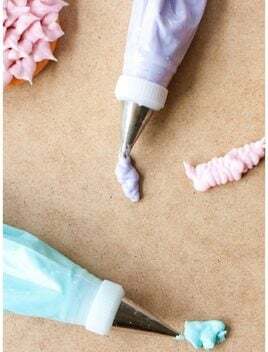 With a dab of water or icing stick them where you want the eyes to be. Use black edible marker to draw black eye balls. 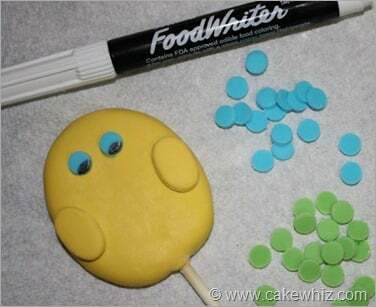 For the beak, cut out small orange colored diamond shape and stick it below the eyes, using some water or icing. Gently press the back of your knife at the center of this diamond to refine the beak. For the wings, brush some water on the wings and sprinkle yellow sparkling sugar. If you want to make hatching chicks, cut out a circle using the medium circle cutter from the Wilton set and then cut this circle in half using a knife. This will be the egg shell. Use a knife to cut out jagged edges near the top of this egg shell. 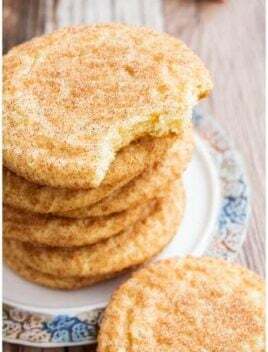 Stick this egg shell near the bottom of the cookie using some water or icing. Smooth out the sides using your finger. Now, make eyes just like you did before using confetti sprinkles and a black edible marker. Make the beak same way as well. And you are done with your hatching chick. You can enjoy these cookie pops as is. But if you want to to do what I did, then push your chick cookie pop into a cupcake. The lollipop stick prevents this cute chick from toppling over. If your lollipop stick are too long, cut them off slightly with sharp scissors. 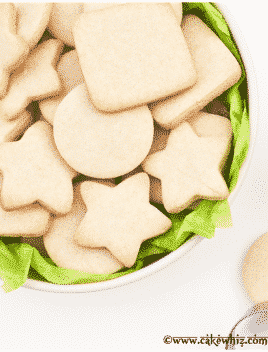 Fill a piping bag with green icing and attach the “grass” tip or the “star” tip. And pipe grass on top of the cupcake. You can use Wilton’s tip 18 to make this “starry” grass OR you can use Wilton’s tip 233 to make this “stringy” grass. 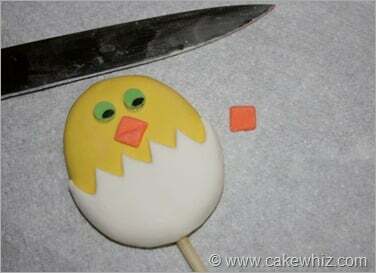 Hope you make these Easter chick cupcakes for your Easter party. 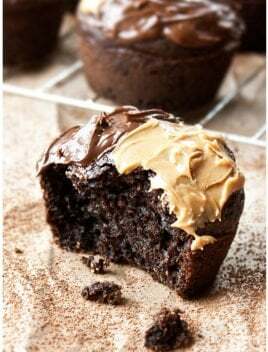 Man they look tasty. 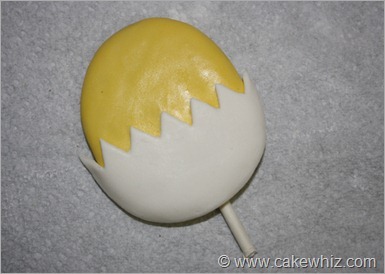 I am definitely gonna make these next Easter in 2012. The kids are going to love this. Thank you for the inspiration!